70년대에 Pierluigi Cervellati에 의해 설계된 산업 건물군은 볼로냐 시내 근교 대지에 위치해 있다. 밝은 조도의 내부공간과 주변의 수려한 녹지를 지닌 기존 건물은 여타 공장건물들에 비해 건축적으로 높은 완성도와 함께 산업 건물로서의 기능성과 효율성 또한 갖추고 있다. 본 공모전은 해당 산업건물군이 문화복합시설로 지역사회에 환원되기 위한 과정과 방법의 제안과, 오래된 공장 건물이 지역 주민이 참여할 수 있는 문화창작 프로그램을 지원하고 양성하는 장으로 거듭나기 위해 필요한 조건을 고찰하는 것을 과제로 한다. 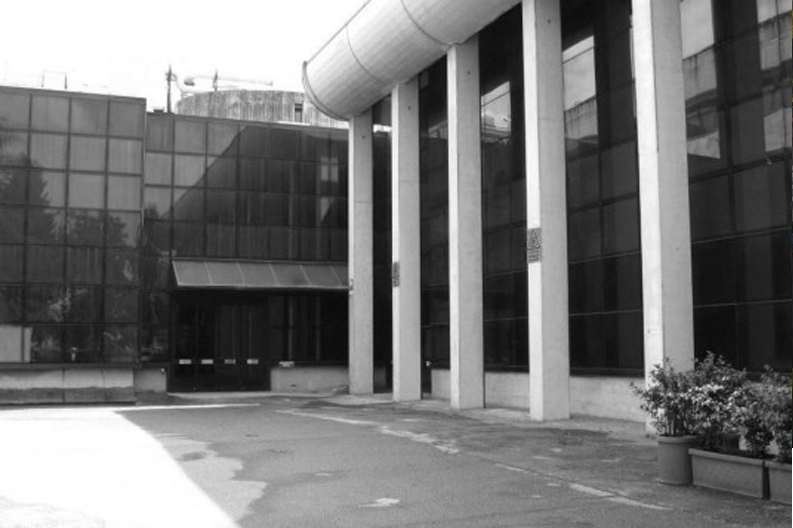 The site is a former industrial park near Bologna＊s city center, which includes a building designed in the 70s by Pierluigi Cervellati. 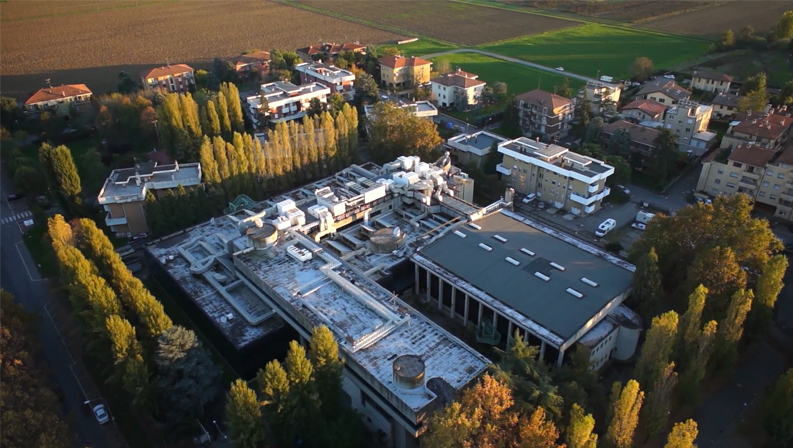 The existing industrial building cluster has been distinguished with its natural lighting inside, rich green areas around, and the organic relation designed between individual spaces. Among the most important issues are to rethink a disused industrial place and transform it in a lively space for culture, art and public relationships. 기존건물군을 살펴보면 중세 수도원과 닮은 점을 여럿 발견할 수 있다. 수도승들의 삶과 수련을 위한 복합시설로 기능하기 위해 다양한 크기와 목적의 독립채 (예배당, 기숙사, 작업실, 회의실, 도서관, 식당 등)가 가장 적합한 자리에 위치해 있고, 그 중심에 옥외 중정이 각 건물을 연결하고 이어주는 구심점 역할을 하는 점은 유럽 각지에 현존하는 중세 수도원에서 공통적으로 발견되는 특징이다. 각각의 독립된 건물은 주어진 기능에 충실할 수 있는 크기와 높이 및 형태를 지니는 동시에, 수도원 전체를 유기적으로 연결하는 모듈 시스템에 영향을 받는다. 사용자의 편의를 위해 관련된 기능의 건물동은 인접해 있고, 건물간 이동을 위한 통로 및 동선은 모듈 시스템의 섬세한 변형 및 적용으로 채워져 있다. 주어진 대지에 위치한 다양한 형태와 크기의 독립채들과 그 중심에 위치한 공터의 관계의 분석은 중세 수도원 시설이 지닌 특징과의 연계성을 찾는 작업으로 이어졌고, 이는 볼로냐 문화센터를 디자인하기 위한 중심 아이디어 제공하는 중요한 기점으로 작용했다. Given conditions of the former industrial building and its surrounding bear uncanny resemblances to medieval monastery complex. 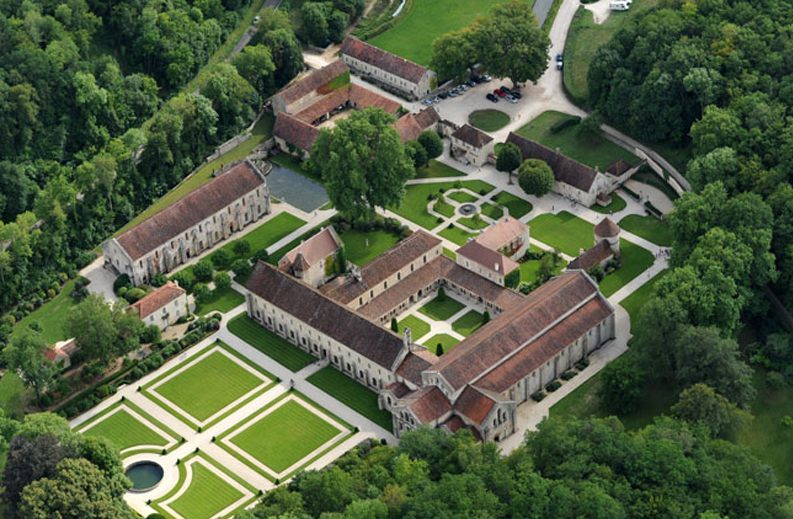 As a monastery was composed with a number of different building types that would support the introverted and self-sufficient life style of clergies and monks, a public open space played an important role as the core element for coordinating and providing accesses to the neighbouring spaces. An enclosed outdoor space is located in between the nave and the trancept of the main church building, around which were dormitory, chapter house, caldarium, refectory, and forge. Though each building is given spaces in different size and form according to their purpose, they all revolve around the courtyard at the center based on a solid order created with modular bays. Each space is independently built and run, yet they are closely interconnected in a way to form the complex as a whole. Related programmes are located near and circulation is thoroughly designed to help the users’ movement. 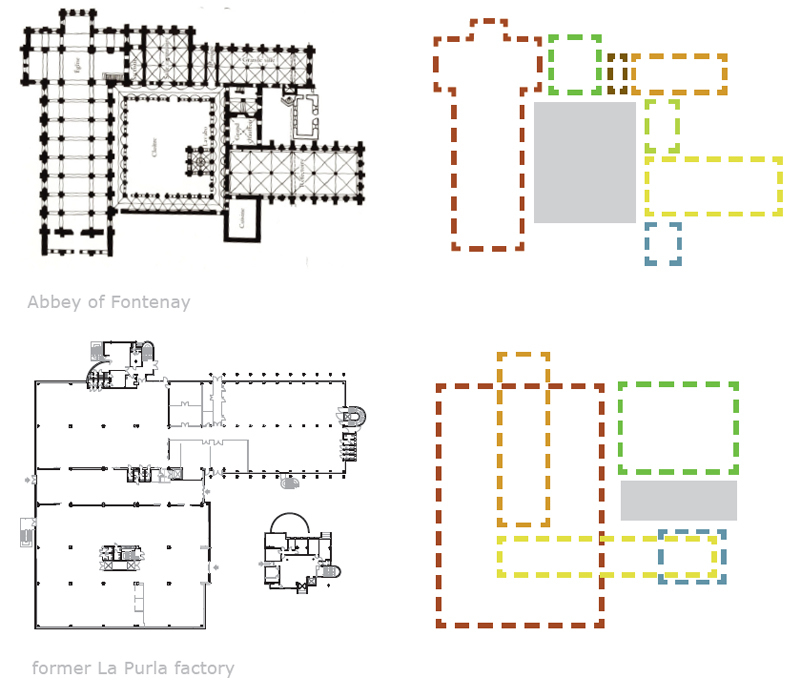 While exploring different design approaches for the new culture center, the strengths and potentials found in the medieval monastery complex becomes the platform for developing main ideas for the new culture center. Besides the structural and spatial similarities, the medieval monastery used to support comparable programmes as today’s culture center. During the medieval eras, monasteries were not only religious facilities where services and baptisms were practiced, but they played a significant role as incubators for art. The church collected and presented holy paintings and treasures for pilgrims, for which gallery spaces were arranged along the nave. Monks learned to supply their everyday cooking wares, and choirs practiced singing every day. Among the finest artworks were created in the community of monastery, because the apprentices were required to repeatedly practice and develop their skills. Culture centers today are expected to serve the similar function in communities. If the art-producing projects were only for and by the monks who inhabited in the complex, surely they were mostly based on practical needs of goods, culture centers now are design to invite the public and provide opportunities to explore their gifts and talents. If the monastery attracted irregular pilgrimage of the selected group of people, the new culture center has to aim for a much wider spectrum of visitors. It has to be public, yet is has to meet specific needs and concerns of the public. While some people would find the center worth visiting on a regular base in order to attend to art classes or to participate in group studies, others may visit the building only when there are special events. With the interesting discoveries made while observing the plans of the medieval monastery and the existing industrial buildings, the new culture center looks back at the aged role model for multi-functional complex. Among many dominant features that create the energies and possibilities of the former factory building, the rigid beam and column structure is found the strongest element to support the new culture center to flexibly serve the community. Rather soft, elastic, and colorful spaces are newly inserted in the current structure, which in result create distinct dynamic and contrast with the existing structure of the building. 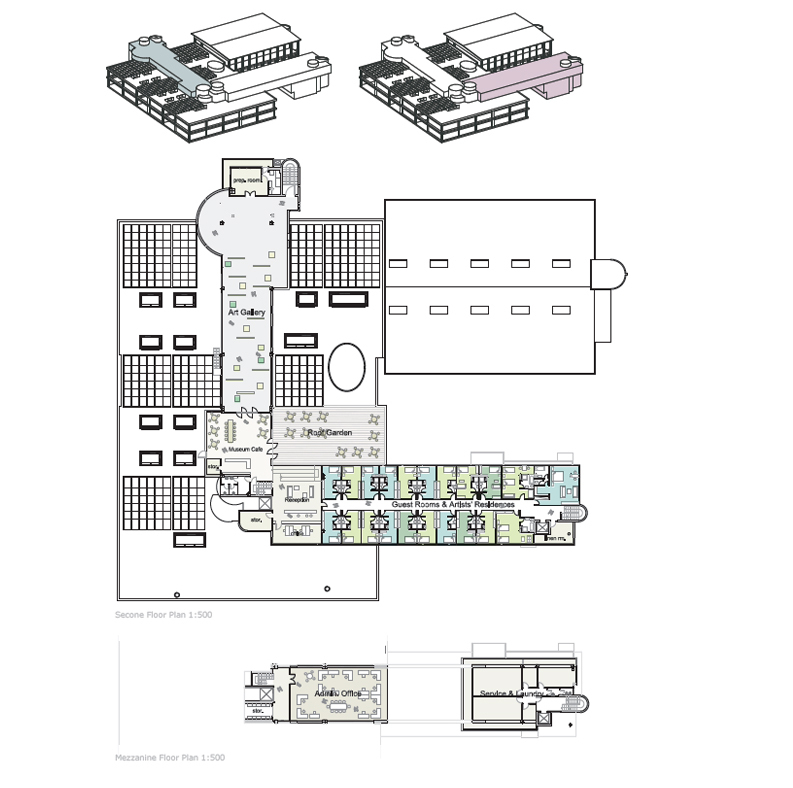 Instead of breaking down floor areas to create separate rooms with the identical ceiling height, the new culture center is firstly looked at as a larger volume and mass as a whole from bird’s eye view. Rigid modules of concrete beam structure provide plentiful options for voids and solids, which lead to the idea to plug the new volumes in to the existing structure. Each block is colorred, programmed, and characterized differently. As the new volumes serve varying programme, the outside of the blocks becomes breathing spaces where the ceiling heights double and structural expression will be exposed. 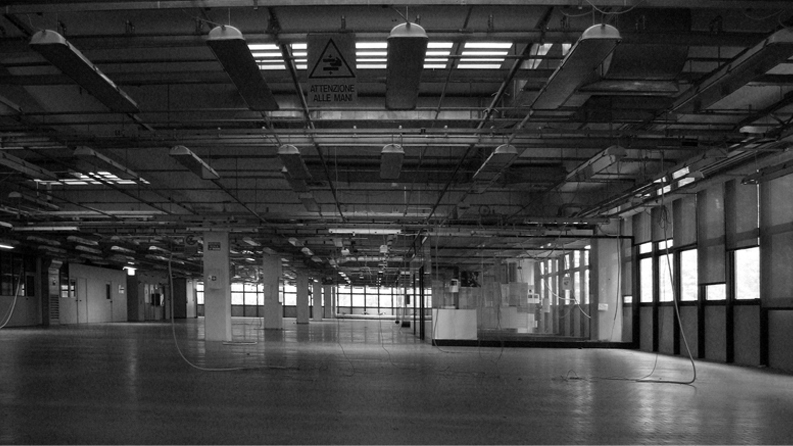 Inside the blocks are occupied with rental offices, artists＊ studios, and multi-purpose halls, while the voids transform to thin pathways and a loose mixing chamber. 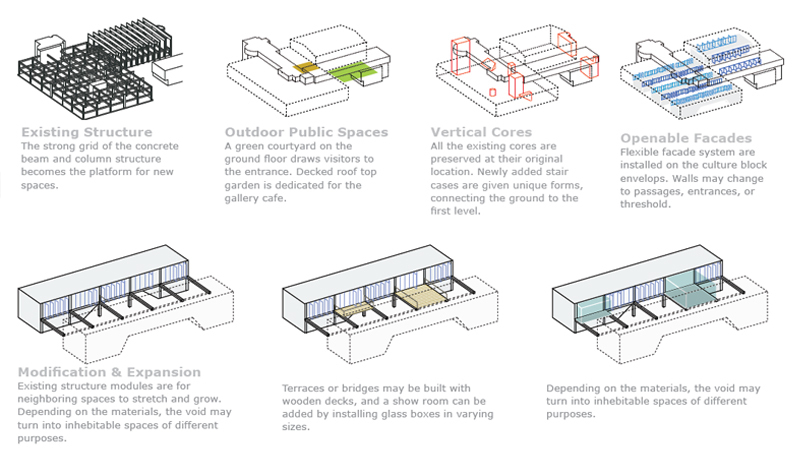 Considering the open plan on the ground floor where a number of public gathering spaces are scattered yet connected to each other, the culture blocks lift up and yield to for the lower level users. With six enclosed rooms at both ends below the blocks, the ground floor supports free flow of programme and dynamic circulations. The semi enclosed area between the main L- shaped building and the separate building provides a welcoming outdoor space. Further than providing access to the entrances, the courtyard becomes the largest and the most important outdoor public space for the culture center. Programmes inside the building can be easily viewed by passers-by, and the exhibition hall can expand from inside out when special events are arranged. Enclosed by Café and restaurant, the courtyard may provide outdoor spaces for extended sitting areas during warmer seasons. 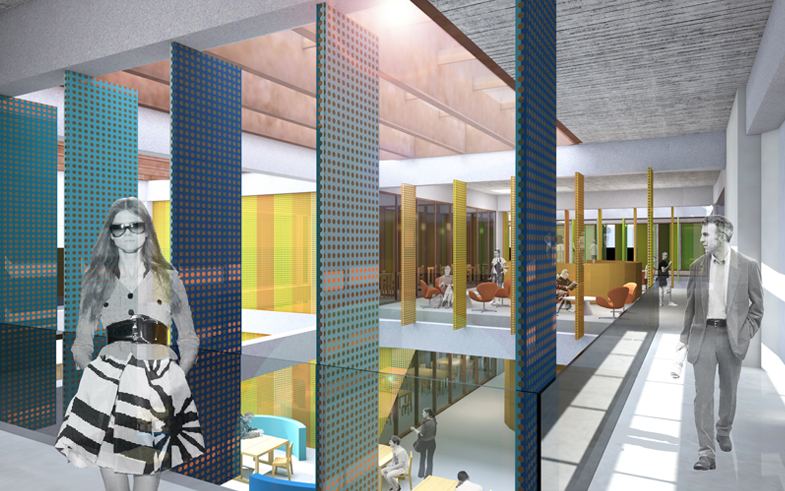 The ground floor presents the lobby, information desks, and public gathering spaces for the visitors, which plays a role as “Living Room” for the culture center. Within the open plan, visitors will find their aimed spaces in between and below the culture blocks. The plugged-in volumes show their colors and characters down to the ground floor, yet the six rooms, which serve as classrooms, meeting rooms and stores, share and introduce the programmes above. Programmes are located according to the level of relevance, needs for noise control, and their required access level. Below the blue block is an experimental area with show-case pods for the start-up companies to present and introduce their products. Presentations are aimed for everyone who has interest in the newest gadgets and applications, which desirably will bring new clients and customers to the upper floors. The small-sized offices on the upper floor share common facilities in the enclosed rooms on both sides. Looked down from the office is IT-Media zone, where visitors will look for music, games, or video clips. Considering the fact that the working atmosphere on the upper floor will have to be apart from noisy visitors, IT-Media zone is designed to attract individual visitors who prefer to spend their own time listening to audio sources. Under the orange block is a newsroom, and the both ends are classrooms for people to take art classes in groups. Next to the artist studios is an open exhibition hall where local artists and students may present their works. The artists’ studios on the upper level, the classrooms and the exhibition area on the ground floor are located closely, so that the middle sector of the building can strongly redefine the characteristic of the new culture center. 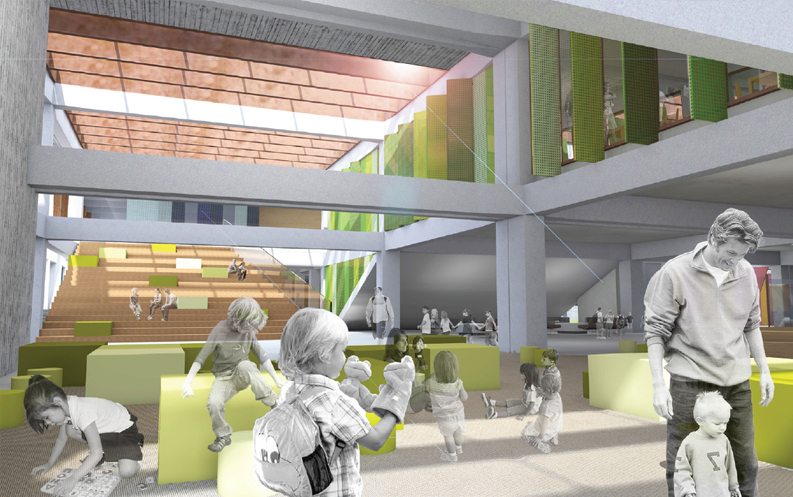 Children’s area is located at the South East corner of the building, near to the kids’ toilet in the core and filled with abundant daylight pouring down from the glass facades on two sides. On the other side of the children’s area is a multi-purpose hall with a grand stand that leads to the performance hall on the upper level. Facing the courtyard is cafeteria and restaurant, behind which are dance studios. As the artists’ workshops and classrooms, the dance studios are located closely under the performance hall. The South void is designed to welcome the most active and noisy visitors, and the noise level decreases from the South to North side of the building. The plugged-in culture blocks are assigned with different programmes. Each block serves spaces that are keenly related to the surrounding areas, yet they support specific groups of people who visit the culture center with distinctive purposes. Compare to the ground floor where the enclosed rooms are juxtaposed with public gathering spaces, the upper floor is aimed for more determined visitors. Floor areas are broken down to smaller spaces to be rented out, and thin passages run through and around the rooms. Each block provides different forms of stairs that land on the ground floor, which accentuates the dynamic atmosphere of the open plan on the ground floor. The blue block on the North side of the building is for offices to be rented out for small sized companies and start-up incubators. 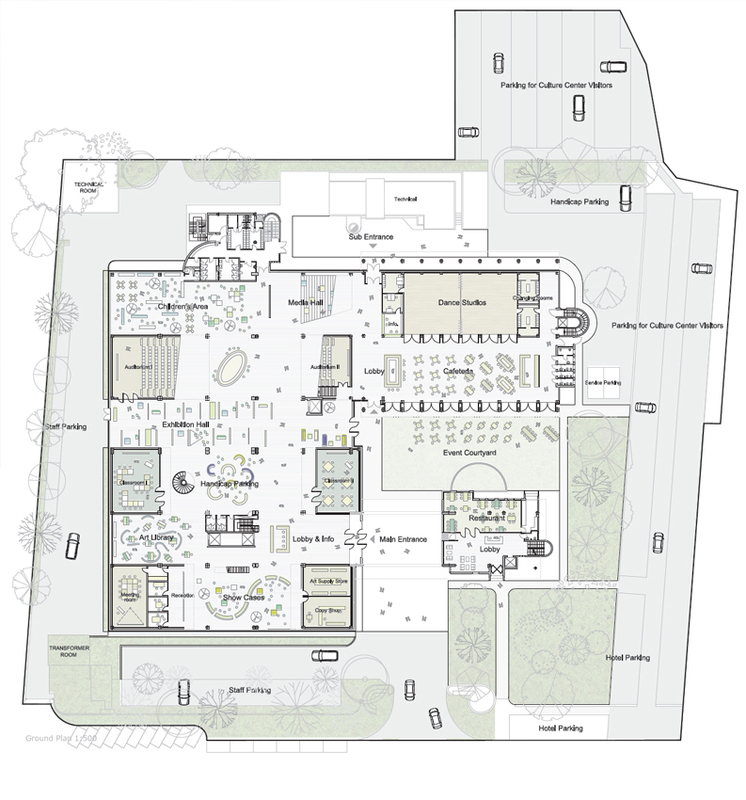 As the space inside the block is ruled by the structural modules, individual offices can be adjoined or broken down for gaining required floor areas. Located at the most quiet zone in the building, the blue block serves intellectual and academic programme for adult groups and young professionals. Thin walkway connects the neighboring offices, and to the vertical circulation and service areas across the void. The orange block in the middle houses a number of studios and workshops. Local artists are to apply for the individual studios, and the selected ones are given opportunities to practice and teach within the dynamic environment of the new culture center. Four larger workshops for art classes and six smaller workshops for artists’ private practice are surrounded by winding walkways. Around the spiral stairs is a resting area for the users. Three auditoriums are located in the green block. Stepped auditoriums on both ends naturally connects the upper and lower levels, and the multi-purpose room in between can be reserved for presentations, lectures, and group seminars or studies. For the noise level is considerably high at the lower level around the green block, the auditoriums are sound proofed with insulated walls. A larger block is plugged in to the West side of the existing building, making use of the ceiling height and distinguished structure. Above the café and dance studios is the performance hall. If the West side of the culture center supports visual art, the West side is dedicated to audio and performing art. The performance hall may be reached via the grand stairs across the children’s area from the ground floor, and the landing area extends to a loop walkways around the hall. The envelope is made of six bays of full-heighted swing doors that can selectively open up the interior façade of the performing hall on both North and South sides. Service areas and preparation rooms are located on the short sides of the block. Set apart from the culture center, hotel is given a separate and independent entrance. The ground floor provides lobby, reception and restaurant facing the courtyard across the culture center cafe, and the upper floors conference and seminar rooms. Those who are involved in art industries or academic fields are encouraged pay their visit for days in order to observe the creative events housed in the complex. Selected guestrooms located in the bridge may be rented for artists who apply for residency program for varying periods of time from weeks to months. Maids’ rooms, a laundry room, and janitor’s closets are located in the mezzanine floor. Running across the three colorful blocks, the art gallery is located on the top floor. Compare to the exhibition hall that is open to public on the ground floor, more private and selected collections may be presented in the gallery. A small cafeteria serves as a resting area, and a roof garden is adjacent to the cafe on the roof top. Closely located to the guestrooms of the hotel, the cafe and garden may be reserved for private events or parties. Hotel guests are welcome in the gallery and cafe. 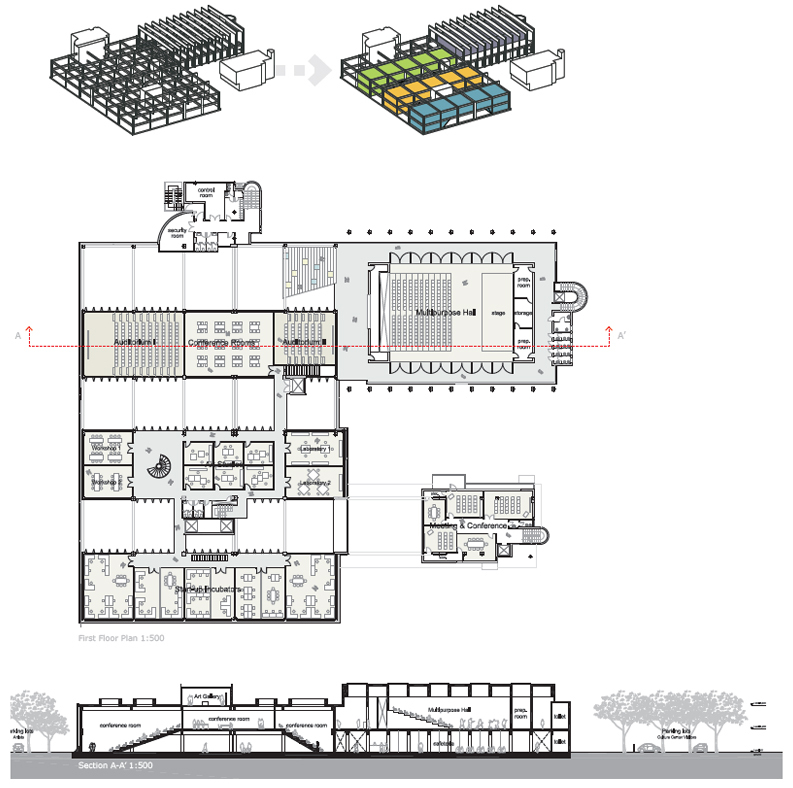 In order for the culture center to adapt to the changing needs of the community, inhabitable spaces in the Plug-In Culture Blocks are designed be modified and adjusted depending on users’ needs. The users may expected to make adjustments for different reasons at different occasions, but the marriage of the existing structure and newly applied interior envelope will bring the building ready and set for varying types of transformation that is to come. While each and every block is dedicated for specific programme with defined spaces, the voids between the blocks are shared by multiple programmes, serving more than one function. Similar to elastic joint around organic cells, the spaces bind the solid blocks together as a whole. When a start-up company needs to expand its office space, or an art studio has to have a temporary storage space in preparation for an upcoming exhibition, the void provides solid platform for the users to build their needed spaces. The existing concrete structure allows the individual spaces in the blocks to extend within the modular system. The voids may transform to paths, terraces, extended working spaces, or resting areas. The interior building envelop for the plugged-in blocks are strongly characterized by folding doors. Existing structure bays are divided into the width of the doors, through which the surface between the columns is completely screened with doors that can turn into varying types of opening. The relation between the solid blocks and voids in between may vary depending on how the users control the level of openness by folding doors. 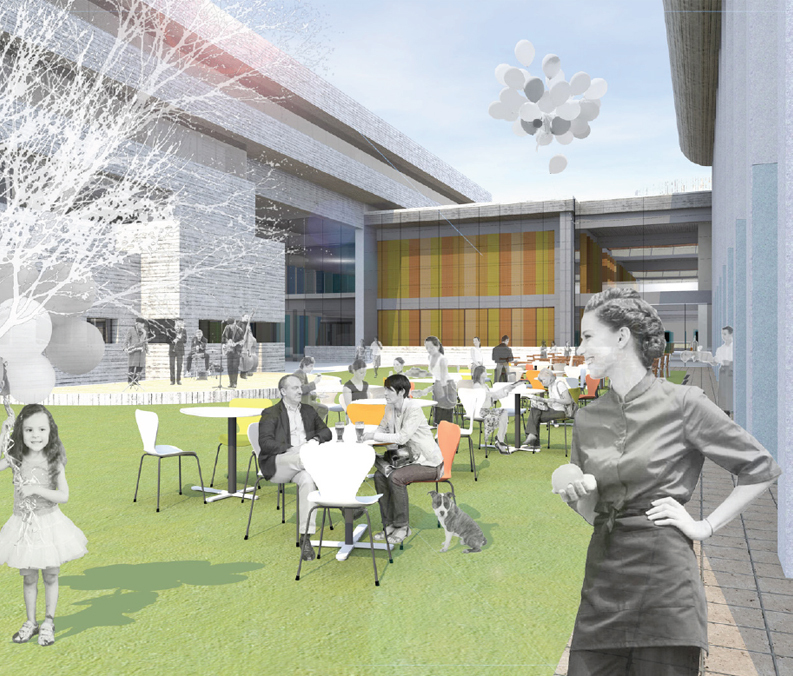 Studios can gain increase its visual connection level to their neighbouring spaces, and the thin walkways can transform to a shared communal space between offices. Provided thresholds, pathways, resting areas, walkways, or buffer zones may change their characters and purposes depending on how users control the façade system. The materials for interior spaces are selectively applied in a way to embrace the existing structure and further create a playful contrast between the old and new. 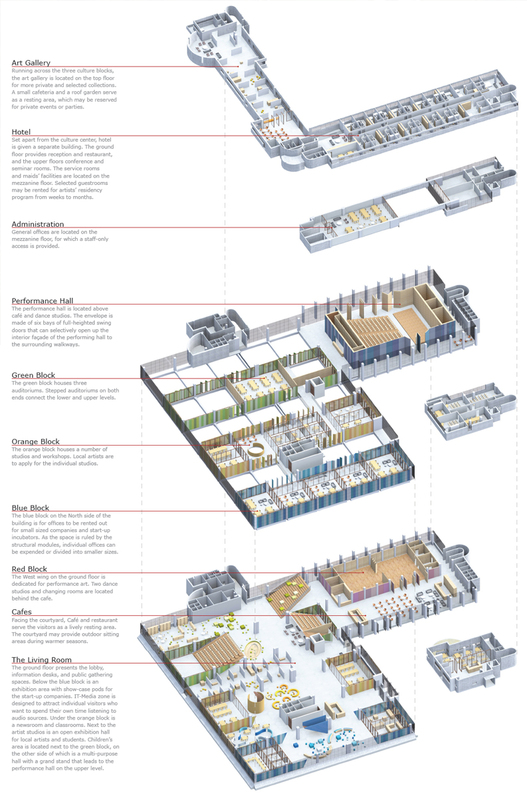 Considering the given characteristics of the current factory space; solid, heavy and rustic, newly added materials are at the opposite side of the spectrum. Glossy and colourful metal surfaces are juxtaposed with dusky concrete, and soft appearance of frosty glass panels are built next to the heavy floor ends. The new components are selected from the array of industrial materials, yet they gently and playfully counteract to the calming old materials. Most of the existing materials are preserved in the interior spaces when there is no modification or renovation applied. Aged concrete walls, columns, and beams are juxtaposed with newly added materials on selected surfaces, which create a playful contrast and dynamics for the new culture center. As each block is uniquely color coded for assigned programme, punched metal panels in varying colors are applied for the folding doors that are installed in the structural bays on interior facades. Through this, not only the culture blocks are defined and distinguished, but the void spaces in between are also strongly characterized with the changing colors on both sides. The porous surface of punched metal doors constantly connects and screens the spaces from inside to out, and the level of enclosure can be fundamentally controlled by folding the door sets. For the modified sky lights on the roof, low vertical louvers are made of corten beams, so that the rustic surface of the beams softens the direct sun light before dropping it down to the void. Thoroughly selected new flavors of colors and light are added to the existing space which was rather subtle and serious, and the old factory is now well revived into the new culture center where the visitors may embrace unexpected encounters, nurture their creativity, and together build their own community spaces. The new culture center is rather a starting point, a new platform for the community to form their stories and take their journey than a complete ending. Once deactivated factory building is now reborn to a space that breaths imagination and creativity on every day base for the locals in Bologna. © 2014 Studio in Loco. All Rights Reserved.